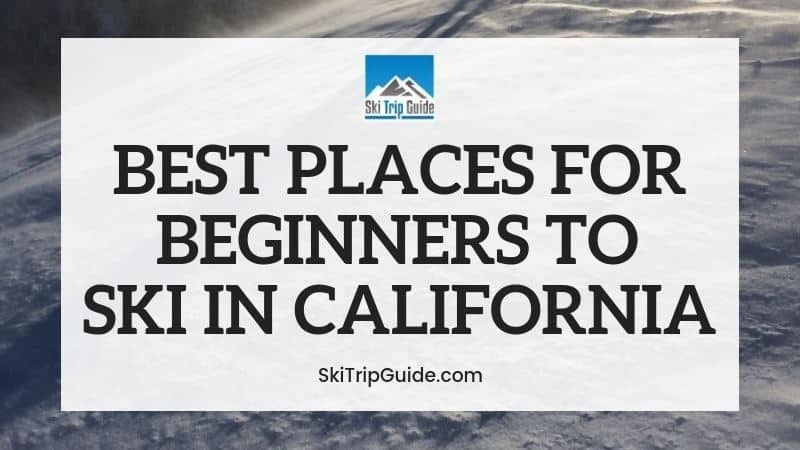 The mountainous terrain of California offers the perfect ski match for any type of skier. Many would argue it's some of the best skiing in the US. There are so many resorts to choose from. June Mountain offers world class skiing with a small mountain feel. They are so dedicated to families and beginner skiers they let kids 12 and under ski for free! You can also save up to 40% when you book your lift tickets 7-days in advance. This is one of the best spots to learn as they are small and focus on new skiers. There are 6 trails that are wide open with easy terrain dedicated to beginners. There is 1 magic carpet located near the lodge. Beginners are welcome to start out there while learning. Beginners can learn how to balance, turn, and stop by taking a lesson. Ages 13+ can choose all day lessons or 3-hour lessons. Kids ages 3-4 can sign up for a morning lesson of skiing. Ages 5-12 can learn both skiing and snowboarding. Half and full-day options are available. Private lessons can be booked for those looking for a more personalized approach. Bring up to 4 friends for no additional cost. Check out their website for current pricing. Rentals are available for all of your needs. Book them at least 2-days in advance and they will have everything ready and waiting for you when you arrive. Save up to 20% off multi-day rentals when you book at least 7-days in advance. Check out their website for details and rates. June Mountain does not offer snow tubing. June Mountain sticks to the basics. They are a no frills ski destination. On the mountain they offer a cafeteria, a bar, and a spot to grab chili or a sandwich on the slopes. Any additional activities or amenities will be found off property in nearby June Lake or at the resort you choose to stay at. June Mountain has a very relaxed vibe and it’s very quiet. It feels as if you are at your own private ski resort! There are no lift lines or crowds. It's a great place to test your skis and learn. Squaw Valley Alpine Meadows are really 2 ski resorts in 1. A total of 6,000 skiable acres spread across 2 mountains. Located in North Lake Tahoe, it was voted ‘Best Ski Resort’ in North America for the third year in a row by USA Today. They are known to provide one of the longest ski seasons in the area. Each providing 25% of their trails for beginner skiers. They even have their own app. At Squaw Valley you will find 14 beginner slopes. On the Alpine Meadows side you will have 2 more. SnoVentures is Squaw Valley's family fun zone. It offers 2 magic carpets. Beginner lessons are offered at both Squaw Valley and Alpine Meadow. Check out their website for the latest deals and pricing. Beginners can rent their skis from either the Squaw Valley or the Alpine Meadows location. The staff will help you select the best product for your skill level and the conditions of the day. Book at least 1 day in advance to save a little money. Check out their rental rates here. SnoVentures offers snow tubing, snowmobiling, and fire pits for lots of family fun. Stay at the Village at Squaw Valley for a long list of off mountain activities. A wonderful little ski resort with very friendly locals and wonderful village. Overall it has excellent terrain for all levels from beginners to advanced skiers. The views and atmosphere are top notch. Mammoth Mountain boasts California’s highest four-season resort with a summit at 11,053 feet. They have 4 base lodges, making it massive. Don't let that scare you. Around each base camp is a wide variety of options for beginner skiers. They even offer a beginner lift ticket. You can't go wrong. There are 21 green trails. This is only 13% of their trails, but there really is a lot for beginners to explore. There are 6 magic carpets around the base lodges. This gives beginners everything they need to get their skiing off on the right foot. Lessons are available for all skill levels. Group lessons are 2-hours (ages 13+), private lessons (all ages), and kids group lessons (separated by age and skill). Buy your lift tickets at least 7-days in advance and save up to 40%! Book your lessons and check out rates on their website. Mammoth Mountain offers 8 rental locations. You can stop by any location to get fitted and pick up rentals. They will also store overnight for multi-day rentals. Book your multi-day rentals 7-days in advance and save up to 20%. Check their website to see pricing and reserve your equipment. Woolly’s Tube Park offers snow tubing and a snow play area for all ages. Warm up in the warming hut or grab hot chocolate and adult beverages. There are so many on mountain activities in addition to skiing: snowmobiling, gondola rides, cross country skiing, snowshoeing, and snow cat tours. When you are ready to warm up: bowling, indoor golf simulators, foosball, darts, and ping pong. Food & Drink: There are more than 23 venues to cover your coffee, snacks, meals, and bar needs. Depending on where you stay, the list extends to include fitness centers, heated pools and spas, and village shopping. It is one of the best mountains to ski for all skill levels. There is something for everyone. Tons of variety. Due to it's elevation, the snow is perfect. Sierra at Tahoe is located in South Lake Tahoe. According to their website, they claim to provide the highest standard of fun and get you on the slopes "faster than you'll find an exit in IKEA". Plus, you can't beat the views from a peak of 8,852 feet. There are 18 green trails designed with the beginner in mind. You won't get bored. Easy Street is Sierra's beginner playground. They have 2 magic carpet lifts and gently banked terrain. Designed to help you learn. Sierra's Snowsports School offers a wide variety of options for beginner skiers. It is located inside Easy Street, which is 11 acres of sculpted SMART terrain to help you learn the fundamentals quickly. Check out the latest rates and options on their website. At their slopeside rental shop, you will be fit with beginner specific equipment from industry leaders. Designed to accelerate the learning curve, you will confidently be skiing down Easy Street in no time. Save money by renting at least 3-days for a discount. Check out their latest prices here. Blizzard Mountain is Sierra's snow tube and snow play park. Rush down 1 of 2 lift-accessible snow tube lanes. There is also a designated snow play area with sledding. Sierra at Tahoe is all about the skiing and snowshoeing. There isn't much else to do onsite. If you're looking for activities, your resort will need to fill in the gaps. There are many local places to choose from. On the mountain, there are 11 different food & beverage options to try: BBQ, Mexican, a donut shop, Java Junction, down home cooking and brew pubs. Something for everyone! Good, easy slopes. Perfect for beginners. It's a fun, reasonably priced mountain. The resort creates a very relaxed environment that is also kid/family friendly. Heavenly overlooks the blue waters of Lake Tahoe. Based on it's location you can ski Nevada or California. They boast one of the most unique snowsports resorts due to having some of the best skiing during the day and Vegas-style entertainment at night. They also have the most skiable acres (4,800) in Tahoe. Beginners get to claim 20% of it for their own. There are 9 green trails at Heavenly. All of their beginner terrain is located towards the top of the mountain, separated from intermediate and advanced skiers. There are 2 designated learning areas (1 in California, 1 in Nevada). Each is equipped with magic carpet lifts for a total of 4. Every day at 9:30, 11:30 & 2:30, they offer a beginner adult group lesson. For those that can ride a chair lift, there are half day lessons as well. Private lessons can be booked for a half-day or full-day session. Schedule as an individual or as a family. Child group lessons are available by age: 4-5, 6-13, half-day, and full-day. To view the latest packages and rates go to their website. There are 7 locations to rent your equipment from Rentskis.com. They even offer free delivery to your hotel room! Everything is custom fit to ensure you are safe and prepared to hit the slopes. Check out their rates and locations here. Located at the top of the Gondola, the snow tube hills are 500 feet long. There is a magic carpet lift to get you back to the top. There is also a mini-tubing area for little kids. Ski all day, party all night. That's what Heavenly is known for. On the Nevada side, take advantage of 5 casino properties with their own array of bars and nightlife. Heavenly also offers 6 of their own apres ski parties with signature cocktails, drink specials, and entertainment. When you're looking for a bite to eat, there are 3-4 options one each side (California & Nevada). As their name says, it really is heavenly. The views are amazing! Almost all of the lifts are high speed so the lines are short and you get in plenty of ski time. There is so much to do around town besides skiing.